Below, Coalition member Dr. Jerry Cooley presents his preliminary findings on the use of ACell MatriStem for wound healing and the promising hair duplication (formerly known as “autocloning”) technique. 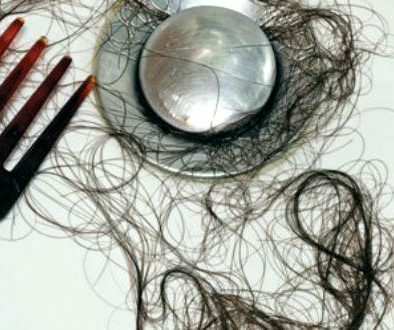 While the below, preliminary data gives hope to hair loss sufferers waiting for hair multiplication technology to provide a cure for baldnesss, much more research and testing is required. 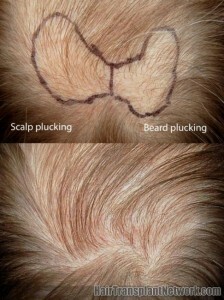 Dr. Jerry Cooley presented this information at the annual 2010 ISHRS (International Society of Hair Restoration Surgery) scientific meeting in Boston, Massachusetts. To view the highlights from the meeting, click here. The purpose of my presentation was to describe my clinical experience over the last year and a half with Acell MatriStem – an FDA approved ECM wound healing agent – in my hair restoration surgery practice. Background on Extracellular Matrix (ECM): The ECM occupies the space between cells and is part of every organ and tissue of every animal species. ECM has “Xenogenic transferability”, meaning we can take ECM from various animals and use them in humans without fear of reactions because the makeup of animal ECM (e.g. cow, pig, horse, human). Use of ECM in surgery has been found to enhance wound healing, promote tissue regeneration, and inhibit scarring. 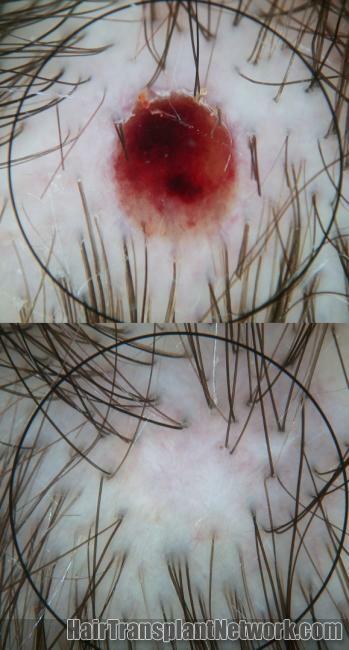 Punch harvest (1-3mm) with some follicle transection resulted in near undetectable healing and follicle ingrowth (photo 1). I did not observe new hair follicles but did observe what appeared to be enhanced regrowth from transected follicles as well as reduced scarring. This suggests that ACell will not create new hair but will help regenerate hair if healthy follicle “primers” are present. Improved the Feel more than the Look of scars; photographs don’t adequately show this effect (see photos 4 & 5). I used Acell MatriStem sheet or powder, and in some situations both. 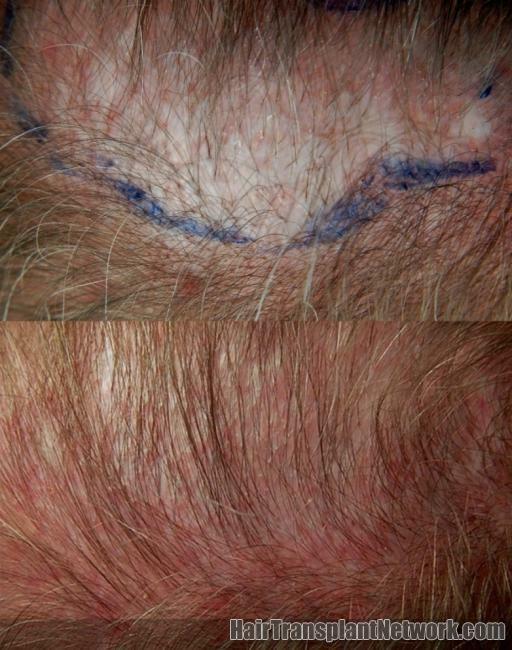 Using ACell made a good closure better and was especially helpful in re-excision of wide donor scars. 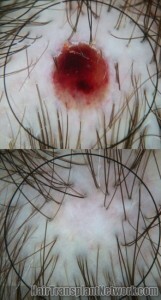 Photo 6 shows a patient with a 1.5-2.0 cm donor scar three months after excision with use of ACell. Although greatly improved, there is still some ‘hairless gap’ which is related to the tension at closure. 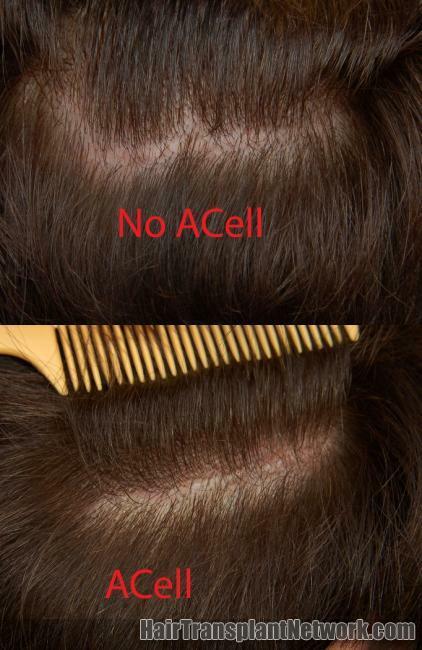 Using ACell did not save a bad closure (ischemia, infection)- for example, if there is too much tension when the strip is removed and the skin edges sutured/stapled, one can expect a depigmented ‘hairless gap’, but it will feel soft like normal skin. 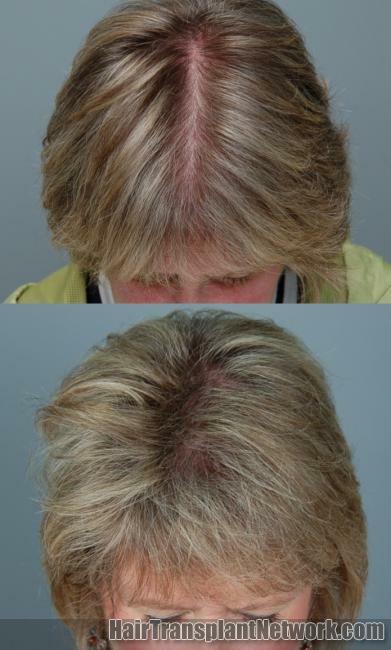 Re-excision felt like virgin scalp- This could prove to be a tremendous benefit for patients undergoing subsequent strip FUT procedures. In fact, this may be the strongest argument for using ACell routinely for strip harvesting. Did not prevent depigmention or “hairless gap” if tension was present. Comment: When people talk about “Donor Scars”, they are referring to different elements which include the hairless gap, depigmentation (the white line), as well as the hard, thick scar that can form. Proper use of Acell MatriStem can prevent the true scar formation but may have no effect on depigmentation or the hairless gap, depending on how much tension or lack of oxygen (ischemia) is present. Almost ten years ago, Gary Hitzig MD began experimenting with using plucked beard whiskers as grafts for transplanting. Gho CG et al. 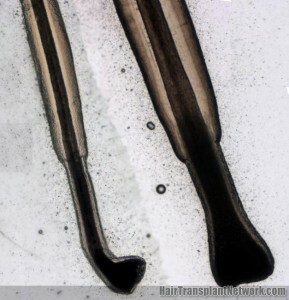 Human follicular stem cells: their presence in plucked hair and follicular cell culture. Br J Dermatol. 2004 May;150(5):860-8. 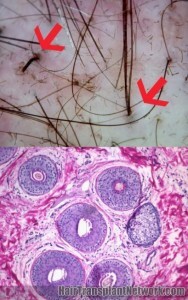 Photo 9: photo of plucked scalp (left) and plucked beard (right); the light border around the darker hair shafts contain living cells. Note how much thicker the beard hair is. 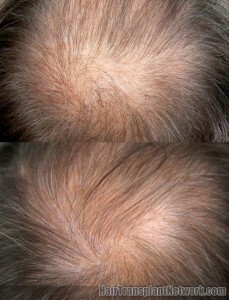 Photo 10: The ‘donor area’ is plucked and when photographed 5 months later, is completely filled in again with new hair. 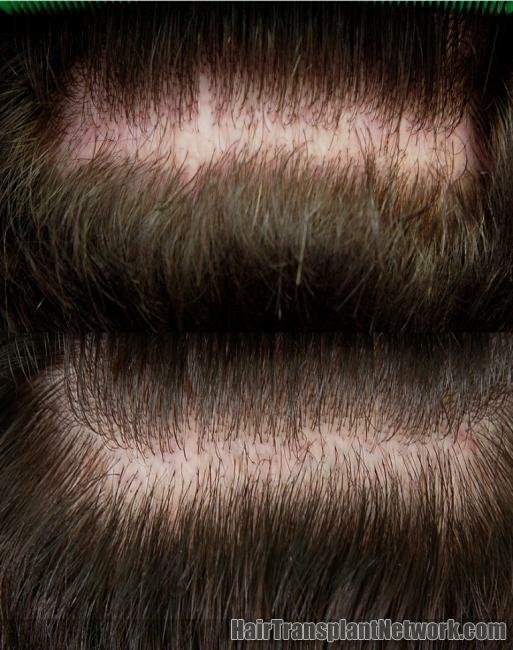 Photo 11: 100 plucked beard grafts in crown; the patient reports that it felt like beard stubble for about 6 months before natural scalp hair began to grow. 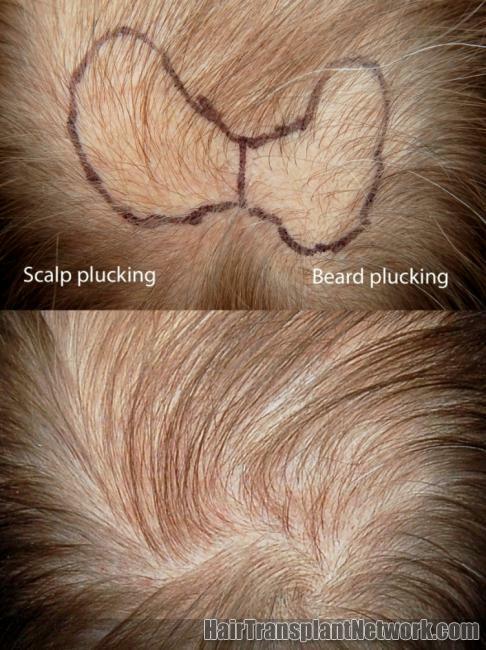 Photo 12: crown grafting shows success of plucked scalp vs plucked beard. 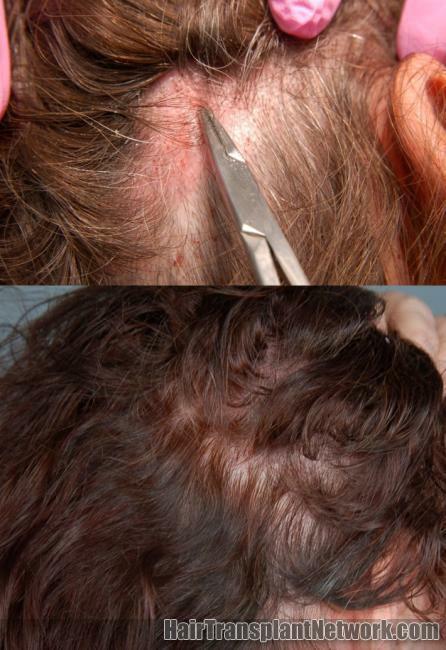 In numerous patients tested, plucked scalp hair worked better. 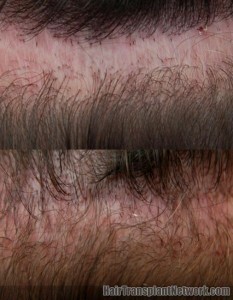 In this case, only 100 hairs per side were placed. 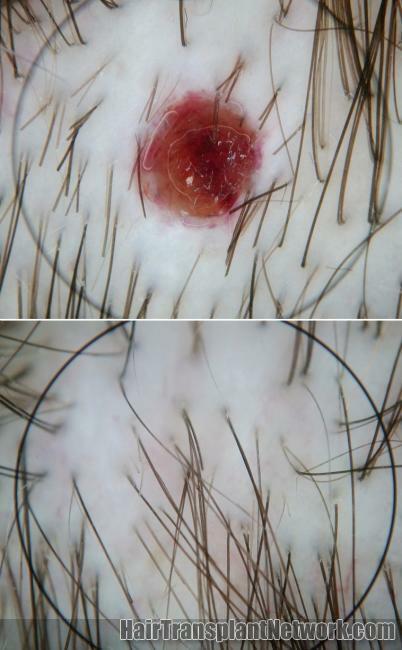 Photos 13 &14: plucked moustache hair planted in the crown after applying ACell MatriStem biopsy of the hair showed completely normal microscopic anatomy, including sebaceous gland and dermal papilla. Photo 15: Plucked scalp hair growing in a thinning crown, about 200 hairs placed. 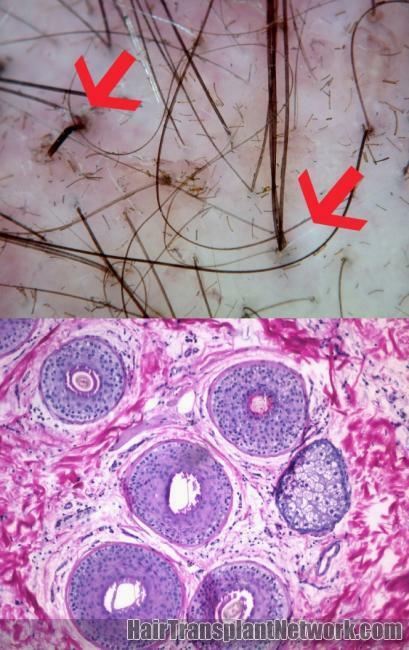 Photo 16 : Plucked beard results: 4 whiskers placed in the same site results in 4-haired follicular unit (right arrow); nearby is a whisker that did not produce hair and is still present 6 months after the procedure (left arrow). 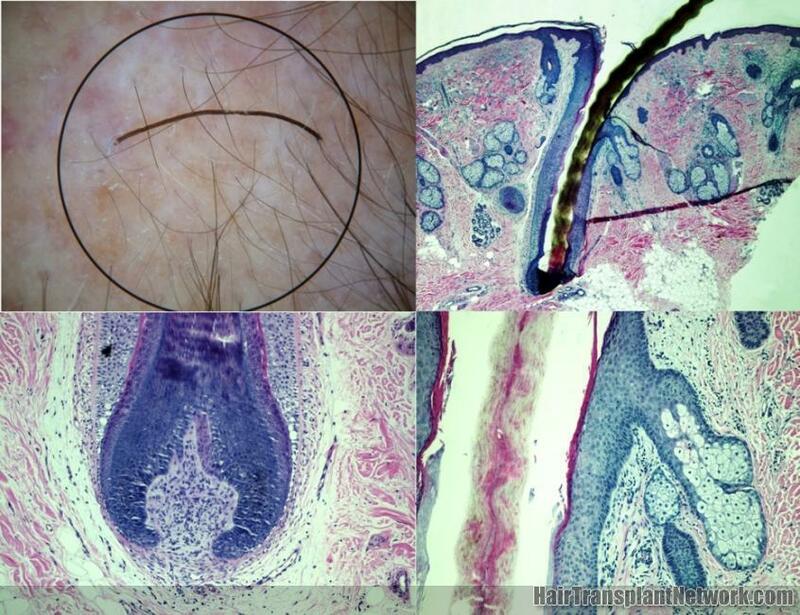 Biopsy of the 4 hair graft shows normal follicular unit histology on cross sectioning. 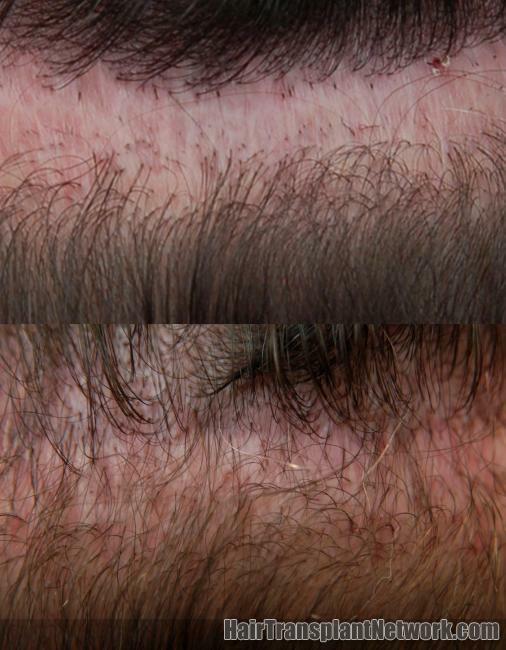 The patient is using a hair fiber camouflage product which can be seen as small flecks on the surface of the skin. Photo 17: Donor scar corrected with combination of FUE and hair duplication (autocloning). We treat many of the patients who come to us with wide donor scars with this technique. We currently do not see as good of results using the plucked grafts into scar tissue which is why we combine it with FUE. We predict that, as the procedure is refined, the success rate for grafting into scars will improve. Will Tanning Affect the Results of My Hair Transplant? 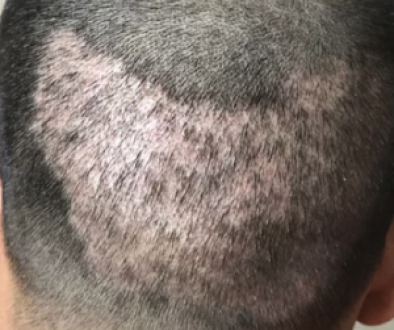 Bumped My Head 5 Weeks After Hair Transplant Surgery … Will this Affect the Final Result? Can Shampooing My Hair After A Hair Transplant Effect The Growth? ACell MatriStem is really awesome. 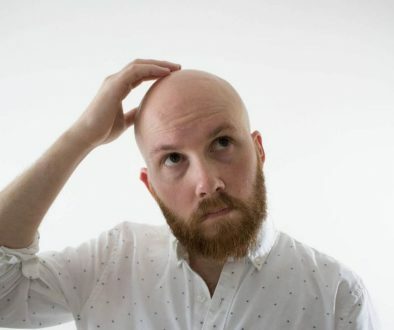 problem sin hair loss is solve! By when would your research provide definitive results into problem 3, namely autocloning? I think it’s a bit difficult to say when this research will be complete. It seems like Dr. Cooley presented some excellent information (which is included in the blog post) with regard to the scientific mechanism behind ACell MatriStem, meaning that the final frontier standing between us and “definitive results” is clinical trials. Acell seems the way to go. Can you buy Acell commercially? If you are out of state, where can I purchase it and how much is it for one application to donor site? ACell is not a commercially available, topical hair loss treatment. For now at least, it is applied only by the hair restoration physician during surgery. 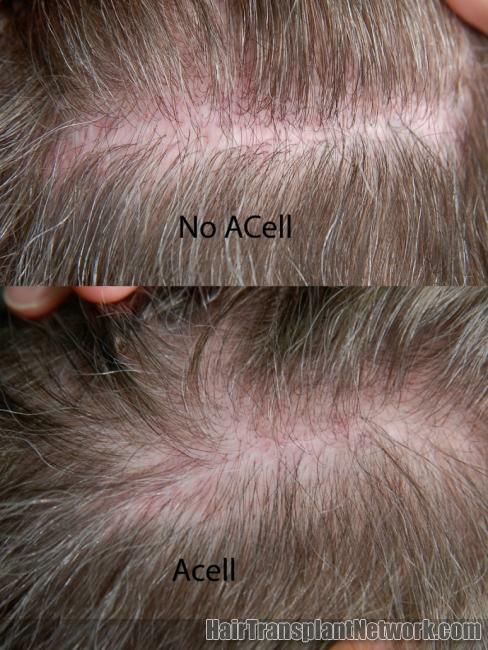 Of course, ACell research, as it applies to hair loss, is still in its early stages. Who knows what future applications may be possible? My husband had an accident with a skill saw in May of 2011. He lost three of his finger tips to the first nuckle and he was treated with Acell with positive results. 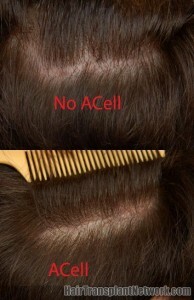 I am very interested in the use of Acell for hair growth because my hair is thinning as a result of metapause. I would love to be involved in Acell treatments related to hair growth.